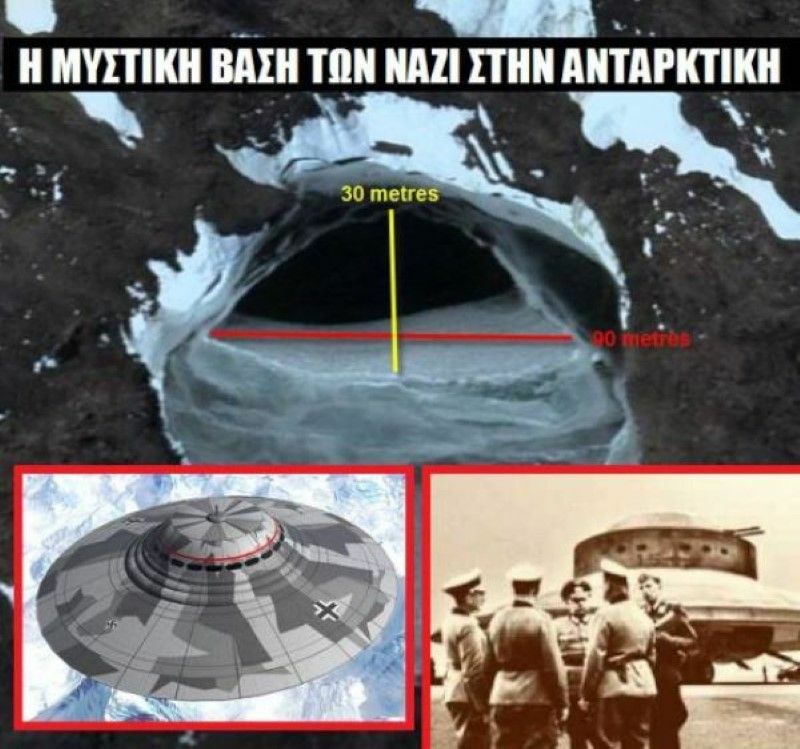 Home » UFO & Third Reich’s secret base in Antarctica NAZI! The Germans, before the outbreak of the second world war, the feeling of having conquered the embargo and the first war turned to research new and alternative energy resources. An unknown space will be explored and the Antarctic. The first German expedition to Antarctica was the Gauss Expedition 1901 – 1903, led by Arctic veteran and geology professor Erich von Drygalski, and it was the first time I used a balloon for aerial observation in Antarctica. The second German expedition to Antarctica in 1911-1912 was the Wilhelm Filchner, who aimed to cross the Antarctic to learn if there were pieces of land without ice. (Neuschwabenland), which began to be explored by Germany on 17 December 1938. To prepare for the mission, the Germans called an American polar explorer and Navy officer, Richard E. Byrd (Richard E. Byrd), who had explored part of the pole in order to establish an American base in the region 1928 – 1930 called Little America. Then Byrd had upset the world press showing a film and saying that he had discovered areas with warm water with vegetation and unknown animals. However, Byrd refused to participate in the German mission. The new campaign was launched by the Germans in Hamburg for Antarctica by ship MS Schwabenland, which could also launch aircraft and using a catapult. On 19 January 1939 the ship arrived in Antarctica in an area that in recent years has been named by Norway as Dronning Maud Land, starting flights, mapping the area. The area was between latitude 69 ° 10 ‘N and 76 ° 30’ N and longitude 11 ° 30 W and 20 ° E 00 ‘, with a total area of ​​600.000 square kilometers. This area was namedNeuschwabenland. During the flight missions and walkers, hundreds of German flags fell to symbolize the German occupation of the ground, but as reported today by German historians was to refute any claims of ownership in Norway. Moreover, the campaign created a temporary camp and reported that the area around them was no vegetation because of the hot springs near the lake. You should mention the official position of the German state of opinion that the whole mission was aimed at the whaling industry was promoted by the end of the ’30s in a very important sector of the German economy. More than 50 ships were whaling season of 1938/39, with nearly 500,000 barrels of oil derivative whale – except Whales are also provided for the manufacture of explosives glycerin. The pursuit of Nazi leadership was to stop the full dependence on imports in a four-year plan envisaged an integrated extension of the German whaling fleet in Antarctica. The mission also aimed to explore for minerals and oil and investigating sites for a possible base of the Third Reich. The next year, one month after hostilities had commenced in Europe, the Germans returned to Neuschwabenland to finish what they had begun, suggesting that the base was under construction. It emerges in the area investigating found a natural tunnel several miles long, which eventually led to a massive underground cavern that was unusually warm that obviously Geothermal Heat.In the huge cave originally found an underground lake, but as it turned out the caverns were so extensive that should be explored separately. The Nazis initially built a base in a cave with docks for German submarines and the electricity was used by the volcanic activity that gave them the heat and steam help produce electricity. On 18 July 1945, newspapers around the world focused on bonds with references to Antarctica.The New York Times, then said ” Hitler is in the South Pole ” . The titles that shook the world rely partly on facts. The events came from the German Admiral Karl Donitz, who later lived free in Germany, stating the bitterness of an officer involved in the general historians who did not dare to write about the great Nazi base with a new name Berlin in Antarctica. The German admiral stated that the German Navy had performed a great job. The German Navy knows hideouts in the oceans and are therefore very easy to ship the Führer in a safe place that will have the opportunity to work on the final plans. The discovery was that they found an underwater trench they went straight through the Antarctic in an underground paradise with hot underground lakes, and vegetation and ice. In 1952, the Government of the new Federal Republic of Germany, investigated rumors about the Nazi base trying to identify the geographical features of the area. A plethora of rumors claims that Neuschwabenland was never abandoned by the Nazis after his first mission. In fact, some members of the crew of “Schwabenland” said they would do several trips to Antarctica to edrefsoun a secret colony of Nazis, and would require the transfer of military equipment and heavy tools mining and tunneling. Indeed remaining records of German naval bases indicate massive displacement technical materials for unknown area and that several German submarines filled with senior executives who fled Nazi Europe, finding refuge in a secret network to underground shelters in Neuschwabenland. German scientists captured by the Allies, while Berlin was bombed, revealed that there were secret documents, drawings and maps that were unknown volatile disk-shaped machines and plants a secret base in Antarctica named New Berlin. Allies in 1947 even more alarmed when informed rumors like the base of the Antarctic operating since at least 1935, thanks to the actions of the group Vril was an independent group with huge funds began with the new technologies and the development of revolutionary futuristic aerial vehicle shaped disc. Microfilm, found a German submarine bound for the South Sea revealed the superiority of the Germans in technology stating that they were at least 50 years ahead. The Americans staged a naval expedition with 48 ships, including submarines was an aircraft carrier and a ship carrying 200 aircraft. Also involved 4,080 soldiers under the leadership of Admiral Richard Byrd (Richard Byrd), the famous explorer, on the pretext of exploration of Antarctica. In fact they wanted to find and destroy the German base. The official name of the campaign was Highjump (OpHjp). The mission arrived in the winter of 1946-1947 and ended in late February 1947. Officially, the mission was extended Highjump Antarctica research base Little America. The Bird was in possession of eight months to complete the mission, but at eight weeks was forced to return with many casualties in fighter planes! What had happened? According to information leaked by men of the mission, the U.S. Navy was faced with a group of real flying saucers. In dogfights which followed the arrival in Antarctica, and four planes were destroyed but 12 perished. As lagged significantly from the firepower of the Germans, the U.S. authorities revoked the mission. In official reports received, the four planes destroyed seems to “experienced technical problems and fell onto icebergs” . As for Admiral Byrd when he arrived in the U.S. he spent several weeks in the investigative agencies. All documents and diary curiously disappeared. The date of his death, in Wikipedia, refers to the March 11, 1957. Admiral of the U.S. Navy and the South Pole explorer Richard E. Byrd in photography in 1955, two years before his death. Already in the 1950’s, rumors began to circulate among German nationalist circles were confident that the war flying vehicles disk type that flew around the world were in fact German super-weapons were being developed during the Third Reich. (Then let’s not forget the incident happened in Roswell). By late 1970, neo-Nazi authors claimed that the legendary Last Battalion, which was intended to preserve the secrets of the Nazis after the war, was a huge underground paradise in Antarctica. The William and Landig, two neo-Nazi editors and writers say with facts, stories and suggestions Nazi revival. Some report that when the Americans failed to hit the underground base of the Germans “Neuberchtesgarden” were hits in Antarctica in 1958 under the pretext of nuclear testing. What we do know is that officially in 1958 as part of Operation “Argus” were three atmospheric nuclear explosions. These tests were actually in the southern hemisphere between 2,300 and 3,500 kilometers north of Maud Land. Of course, others may be products of unbridled imagination but no one has denied the resounding failure of the mission High Jump and the testimonies of senior experienced crews that flying objects in Antarctica.